Wristbands are cool, colourful, and even hi-vis and what’s more, they’re great for promoting your brand or event. Charities have to work tirelessly promoting themselves and making people aware of them in order to garner funds. One way to encourage donations could be to give away a colourful wristband in exchange for a donation. Wristbands like these look great worn with a casual T shirt and jeans, plus you’ll find they get people talking and help to break the ice in a discussion. Available to purchase in smaller quantities, too, they’re ideal for smaller fundraising groups too. If you’re hosting a large event such as a festival, sports day, or conference then keeping tabs on attendees can be a challenge. Cast your mind back to when you had to have your hand stamped with indelible ink in order to get in and out of venues; or if you attended a conference you had to wear your name on a piece of card around your neck. Nightmare! Wristbands are comfortable and discreet and we don’t know anyone who doesn’t like them. They can also help you identify groups of people more easily. For instance different coloured wristbands could signal access to certain areas. With a choice of material too, you can also decide how durable you need your wristbands to be. Every host fears bad weather will put a real dampener on their event and it certainly plays havoc with paper entrance tickets. Waterproof wristbands are durable and easy to locate since they’re on your wrist. No more soggy tickets that are almost impossible to read. Nobody likes queuing for an event at the best of times, and if the going is slow frustration soon sets in. It’s really annoying when people don’t have their tickets ready and have to seach through their wallets or bags. It’s even more annoying when people are asked to produce ID or show their back stage access pass. 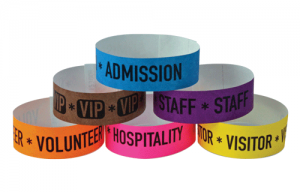 By supplying appropriate wristbands, people on the doors can identify attendees in a matter of seconds, and attendees are able to walk around freely with their wristbands in full view. Queues move faster and everyone is happy. Result! You’ve probably all experienced that dreadful moment when you lose sight of your child, albeit temporarily. It’s easy for children to get distracted when you’re shopping, in the park, around the swimming pool, and on the campsite, particularly when it’s in a place where they’re having fun. Zonal or ID wristbands means your child can be quickly returned to you, and what’s more they won’t mind wearing the wristband either. There you have it – 5 of the best reasons to use custom wristbands. As well as providing security solutions for some of the largest events in Melbourne we also supply some of the best wristbands. Get in touch with MA Security Guards for more information by calling 1300 020 406.